Steve and I spent Saturday morning at a meditation workshop run by one of my yoga teachers. We discussed meditation from scientific, historical and yogic perspectives and practised a variety of meditation techniques. Among many interesting things that we talked about, there was one idea that particularly resonated with me and that I wanted to share here. It is the notion of patience as the opposite of doubt, and impatience as the opposite of faith; an alignment that I found very powerful. I have a basically optimistic outlook on life, best characterised by a general belief that things tend to work out all right in the end. But I had never before made the connection between having a vague hope that things will work out, and having the patience to remain constant within myself in the meantime. 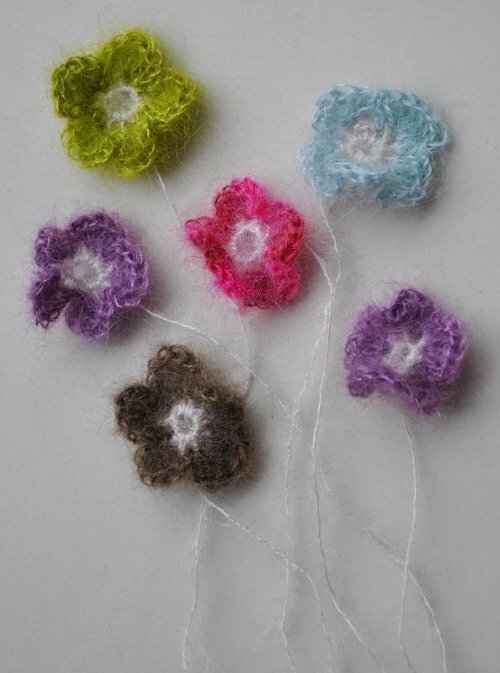 The flowers in the photo are the first of many that I need to crochet for the vintage tea cosy that I am making. They are fiddly and are taking me far longer than they should for something so small. Working on them is in itself a little excercise in patience. Remember the Druid mittens I made just before Christmas? Well, now they have a beret to match! I decided a couple of weeks ago that I wanted to turn the mittens into a set, particularly with the cold weather we’ve been having here recently. So, I ordered some yarn from Jamiesons of Shetland to match the mittens, this time in a DK weight (the mittens are made in 4 ply). While I was waiting for it to arrive I started playing around with chart paper and a pencil. I wanted to use the cable-and-bobble and plaited cable patterns from the mittens, and incorporate them into a slouchy beret. 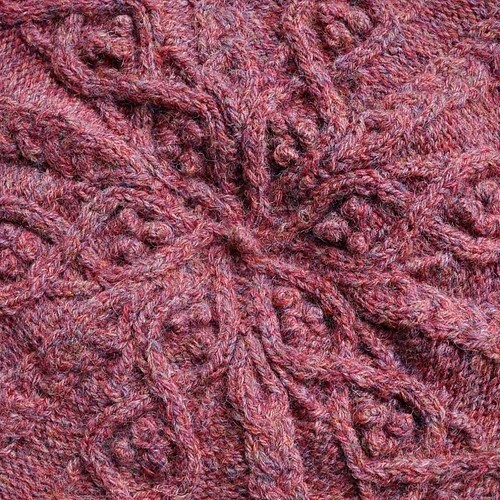 I am planning to write the pattern up and share it as a free download on Ravelry. I will not be making a charge for this design, as I see it as riffing on Jared Flood’s theme, rather than creating something from scratch myself. 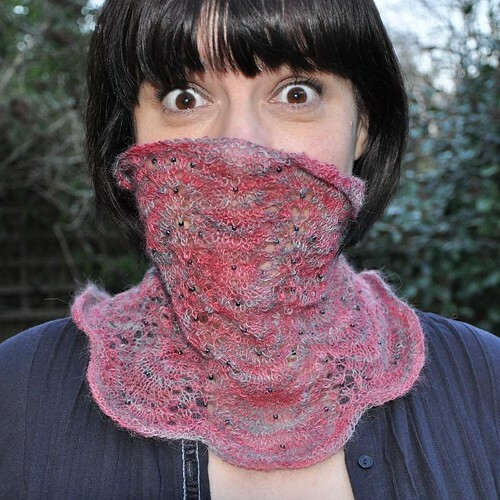 However, I’ve got a bit of a problem – I need to find a (mac-compatible) knitting chart program. For basic charts I use a knitting font in Word, which works fine. 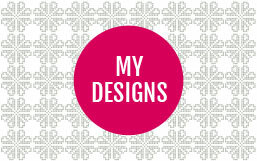 But there are all sorts of stitches in this pattern that aren’t covered by that program. 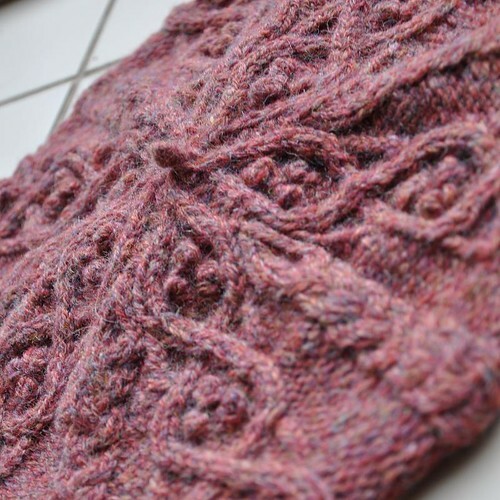 I could write the pattern out line by line, but I know that my preference is to work from a chart, so I would prefer to provide one for other knitters to use. If you know of a charting program, I would really appreciate being pointed in the right direction for it. 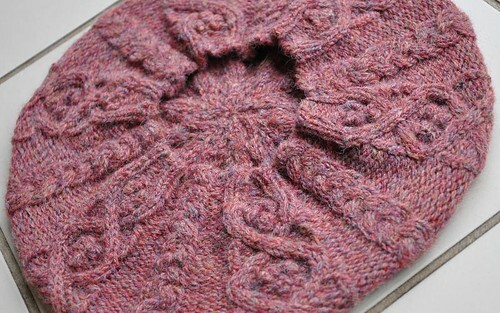 Finally, I just wanted to share another detail that I love about this beret – it is finished off with a bobble! So, my project list (on the sidebar to the left) is getting rather short. 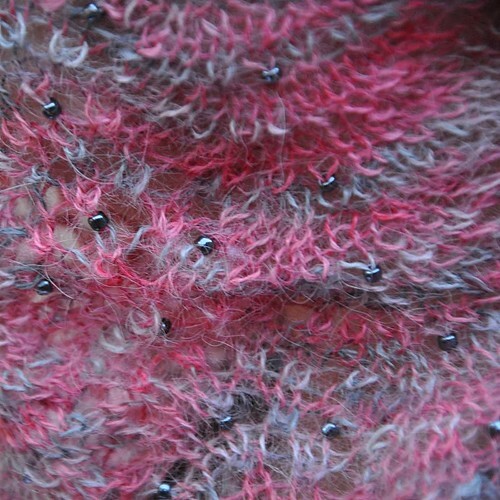 One Anemoi mitten still to knit, a half-finished tea cosy and my laminaria shawl, the pinkness of which, if I am honest, is not growing on me. Hmm – time for something new. At the weekend a big squooshy bag of subtle, quietly-coloured beigy-grey Jamieson Heather wool arrived, and I immediately stopped everything I was doing and cast on for a Hemlock Ring Blanket. It was a close call between that and Girasole, both by Jared Flood, but in the end the Hemlock Ring won out, largely because of such lovely examples as Bells’s and Michelle’s. So far I’m loving knitting this! 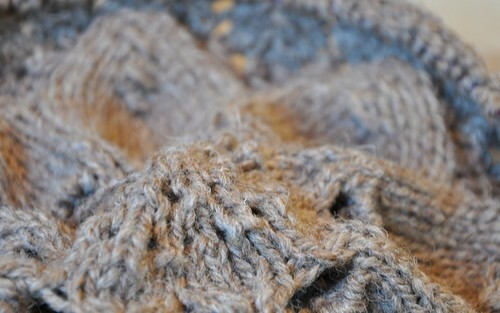 The wool is warm, soft and comforting to work with. It is also chunky, and is flying off the 6mm needles. Maybe it’s because I’m so used to smaller needles and thinner wool, or maybe because it’s so … not pink, but this project feels like a really refreshing change. I’m planning for it to live on a footstool that is covered in a Shetland tweed check fabric. The blanket will fulfill the dual function of keeping us cosy when needed, and protecting the footstool when we put our afternoon tea tray on it! Yarn: Cherry Tree Hill Suri Laceweight, in the Gypsy Rose colourway. 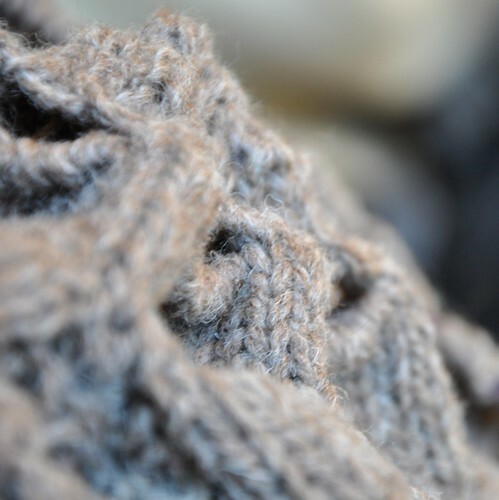 This was really nice yarn to work with, and is warm and soft to wear. 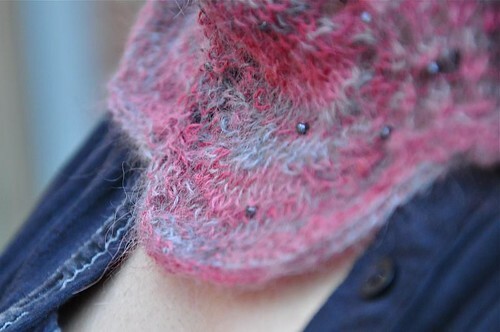 Notes: I wanted more of a neckwarmer than a cowl, so I cast off after 9 inches. I also wanted the edgings to be simpler than specified in the pattern, so I begun and ended the cowl with 6 rows of garter stitch. First of all, thank you so much for all your lovely birthday wishes – they really made my day! At our wedding ceremony the vicar, knowing how much we loved hiking and hill-walking, spoke beautifully about cairns, the piles of stones that act as landmarks or were used to guide travellers on their paths. He used them as a metaphor for events, such as a wedding, that mark moments in our lives. The image has stayed with us over the years, as we have taken various twists and turns on our journey together. This week we have arrived at a cairn that marks the start of new phases in both our lives. And Steve has gone back to work this week after a three month sabbatical. He flew off to Chicago yesterday, the first of many trips there and elsewhere around the world. I’m excited for him about his new job, as I think it will be one that he’ll love and on which he will thrive. But I am feeling quite sad at the change from having him here every day, to him being away for perhaps half his time. These thoughts of old phases and new, of cairns and turning points, reminded me that I have not yet shared any of my vintage knitting collection here. 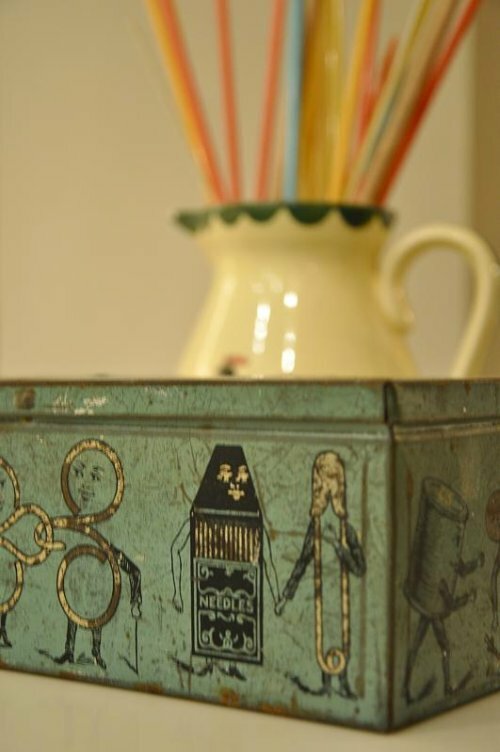 I love collecting, both the tools and the products of the handiwork of previous generations of women. I find that these relics in themselves act as markers, as comforting reminders, of how our craft has been passed down from one generation to another. 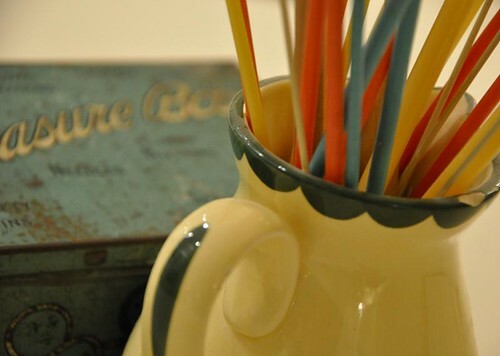 These are my grandmother’s knitting needles. 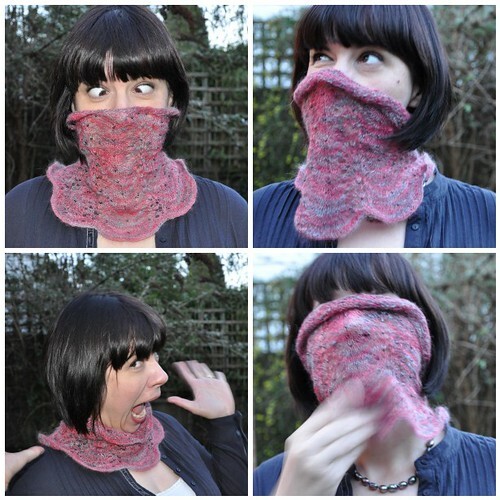 They are not at all good to knit with, as they are sticky, bendy and all round unpleasant. But I adore seeing them in a jug on my shelves as they transport me back to my grandmother’s house, to her teaching me to knit tiny scarves for my teddy bears while she made amazing outfits for my Tiny Tears and other dolls. 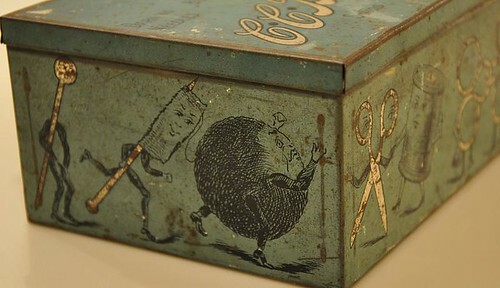 The tin is a metal sewing box. It’s too rusty to use, but again, I love it. It has compartments inside for such essential items as glove buttons, pearl buttons, studs, darning needles and linen buttons, all of which sound like relics from another world. And how about this illustration? I think it would have both obsessed and scared me when I was a child!